Do You Recognize These? These Are The Famed French Black Truffles! Share a special day and give the gift of a "Lunch in Provence" Culinary Experience, with a personalized gift certificate, ordering online, or organizing a private class. Please contact Bonnie for details, or (tel) (760) 402-7600. Sunday, February 12, 2017, 11am to 3pm, $120.00 per person or "Special Date Night," Thursday, February 16, 2017, 4:30pm to 7:30pm. Celebrate "Valentine's Day" with Loved Ones. A dreamy seasonal menu created especially to share with your loved ones. Menu: Cream of Cauliflower Soup; RivaRose Brut; Marinated Flank Steak; Potato & Sorrel Gratin; Endive, Roquefort, and Walnut Salad; Domaine de Manion Wine, and Dark Chocolate Terrine with Orange Sauce. Thursday, March 2, 2017 or Sunday, March 5, 2017, 11am to 3pm, $120.00 per person. PLEASE NOTE: Sunday, March 5, 2017 is SOLD OUT with a private party. "Spring Flavors from the Potager." This menu takes advantage of many spring flavors growing in the garden and lends a touch of elegance for a special occasion. Menu: Broccoli Soup with Homemade Croutons; RivaRose Brut; Goat Cheese, Artichoke, and Smoked Ham Strata; Three Lettuce Salad with Hazelnut Vinaigrette; Sautéed Swiss Chard with Garlic & Lemon; Domaine de Manion Wine, and Homemade Pecan Rum Raisin Ice Cream. Sunday, April 2, 2017 or Thursday, April 6, 2017, 11am to 3pm, $120.00 per person. "Celebrating Springtime Asparagus and Luscious Lemon." Asparagus and lemon flavors are two of the important and prevalent flavors in Provençal cuisine. I love to use flavors as a theme and weave them throughout a menu in a layering effect. In celebration of asparagus and lemon, this menu has both as flavor threads. Lunch Menu: Asparagus Soup with Lavender Lemon Creme; RivaRose Brut; Lemon Chicken; Domaine de Manion Wine; Spring Lettuces with Creamy Meyer Lemon Dressing; Spring Grain Salad with Asparagus & Meyer Lemon, and Lemon Tart. One of my favorite holiday breakfast cakes is Cranberry Upside-Down Cake from Cooking Light, December 2006. You can serve it for a make-ahead brunch or warmed on Christmas morning with cinnamon coffee or hot chocolate. It has a buttery cake texture with a nice blending of sweet and tart, and a bit of wow appeal. Serves 12 people (serving size 1 square). Give the gift of "Lunch in Provence" cooking classes and culinary experiences this holiday with personalized gift certificates, ordering online, or organizing a private class. Please contact Bonnie for details, or (tel) (760) 402-7600. Thursday, April 27, 2017 or Sunday April 30, 2017, 11am to 3pm, $120.00 per person. Year 2016 flew by! Last year at this time I was selected by Miracle-Gro as one of four California home gardeners to ride on their float and participate in their activities surrounding the 2016 Tournament of Roses Parade. Lately, I have been asked if I am once again part of Miracle-Gro's float and Tournament of Roses Parade. Sadly I am not, it was a once-in-a-lifetime experience to cherish and remember. I will be eagerly watching the Tournament of Roses 2017 parade with fond memories! As I reflect back on 2016, I am very grateful and thankful to all of you who have touched my life, like precious kaleidoscope-colored mosaic pieces. In Oprah magazine, December 2016 issue, there are wise words from Oren Arnold; novelist, journalist, and humorist, "Christmas gift suggestions: To your enemy, forgiveness. To an opponent, tolerance. To a friend, your heart. To a customer, service. To all, charity. To every child, a good example. To yourself, respect." Wishing you Joyous Holidays! Wishing you Happiness, Health, and Good Fortune in 2017! Take the plunge, if you have been thinking of coming to a "Lunch in Provence" cooking class, there are a few seats available for the class on Thursday, November 10, 2016, 11am to 3pm, $120.00 per person. Advance payment for your reservation can be placed online by shopping cart at www.bonniejomanion.com or by check. "Que Syrah, Syrah Lunch." Enjoy a spectacular fall lunch beautifully paired with our bold, rustic estate Domaine de Manion Syrah. November's culinary classes are lovingly adapted recipes from Contributing Editor Sara Foster at Cottage Living Magazine, remember that great magazine! Lunch Menu: Chicken-Liver Pâté, Goat Cheese with Marinated Olives, Field Greens with Pears, Brussel Sprouts, Fennel, and Mint, RivaRose Brut, Cider Roasted Winter Squash, Herb Rotisserie Leg of Lamb with Mint Chimichurri, Domaine de Manion Syrah, and Caramel Apple Upside Down Olive Oil Cake. The Table is Set for Cooking Classes This Fall! Take the plunge, if you have been thinking of coming to a "Lunch in Provence" cooking class, a French culinary experience. Most dates below are still open. PLEASE NOTE: Sunday, October 9, 2016 and Sunday, November 13, 2016 classes are SOLD OUT! Advance payment for your reservation can be placed online by shopping cart at www.bonniejomanion.com or by check or credit card. Please indicate which date and particular class you plan attending. These events are limited to 10 people, with a minimum of 6 people. Please contact Bonnie for more class information, information for those who are out-of-town, booking private classes of 6 or more, and group reservations at (760) 402-7600. No cancellation refunded within 72 hours of event day. Thursday, September 15, 2016 or Sunday, September 18, 2016, 11am to 3pm, $120.00 per person. "A Taste of French Country Cooking in California" I have been an avid advocate of marrying the best flavors of France and California for many years. September's culinary classes are lovingly adapted recipes from like-minded Theo Stephan's cookbook, Olive Oil and Vinegar for Life. Stephan calls her trademark style "Caliterranean." Lunch Menu: Peppered Almonds, RivaRose Brut, Mondo Short Rib Brioche Sliders, Hale the Kale Salad, Avocado Soup with Sesame Spice Garnish, Domaine de Manion Rhone Wine, and Zucchini-Olive Oil Cake. Thursday, October 6, 2016 or Sunday, October 9, 2016, 11am to 3pm, $120.00 per person. PLEASE NOTE: Sunday, October 9, 2016 is SOLD OUT! "Experience Autumn in Provence," with good company, great food, and a leisurely lunch with a view of our fall vineyard. October's culinary classes are lovingly adapted recipes from Jocelyne Sibuet, an author on French country living and designer of 7 boutique hotels with her husband, Jean-Luis. One of these properties is La Bastide de Marie (a former 18th-century farmhouse, now a charming boutique hotel), complete with vineyards, herb gardens, and olive and lemon trees, in Menerbes, a hilltop town in the Luberon region of Provence. I had the opportunity to visit this special property in 2008. Lunch Menu: Oven-Roasted Tomato & Fresh Thyme Tartines, RivaRose Brut, Eggplant Tian with Tomato Coulis and Herb-Marinated Goat Cheese, Beef Daube with Egg Noodles, Domaine de Manion Rhone Wine, and Plum-Almond Crumble with Vanilla Bean Whipped Cream. Thursday, November 10, 2016 or Sunday November 13, 2016, 11am to 3pm, $120.00 per person. PLEASE NOTE: Sunday, November 13, 2016 is SOLD OUT! "Que Syrah, Syrah Lunch." Enjoy a spectacular fall lunch beautifully paired with our bold, rustic estate Domaine de Manion Syrah. November's culinary classes are lovingly adapted recipes from Contributing Editor Sara Foster at Cottage Living Magazine, remember that great magazine!Lunch Menu: Field Greens with Pears, Brussel Sprouts, Fennel, and Mint, RivaRose Brut, Cider Roasted Winter Squash, Herb Rotisserie Leg of Lamb with Mint Chimichurri, Domaine de Manion Syrah, and Caramel Apple Upside Down Olive Oil Cake. Please contact Bonnie for more class information, information for out of towners, booking private classes of 6 or more, and group reservations at (760) 402-7600. No cancellation refunded within 72 hours of event day. Thursday, October 6, 2016 or Sunday, October 9, 2016, 11am to 3pm, $120.00 per person. "Experience Autumn in Provence," with good company, great food, and a leisurely lunch with a view of our fall vineyard. October's culinary classes are lovingly adapted recipes from Jocelyne Sibuet, an author on French country living and designer of 7 boutique hotels with her husband, Jean-Luis. One of these properties is La Bastide de Marie (a former 18th-century farmhouse, now a charming boutique hotel), complete with vineyards, herb gardens, and olive and lemon trees, in Menerbes, a hilltop town in the Luberon region of Provence. I had the opportunity to visit this special property in 2008. Lunch Menu: Oven-Roasted Tomato & Fresh Thyme Tartines, RivaRose Brut, Eggplant Tian with Tomato Coulis and Herb-Marinated Goat Cheese, Beef Daube with Egg Noodles, Domaine de Manion Rhone Wine, and Seasonal Fruit Crumble with Vanilla Bean Whipped Cream. Thursday, November 10, 2016 or Sunday November 13, 2016, 11am to 3pm, $120.00 per person. "Que Syrah, Syrah Lunch." Enjoy a spectacular fall lunch beautifully paired with our bold, rustic estate Domaine de Manion Syrah. November's culinary classes are lovingly adapted recipes from Contributing Editor Sara Foster at Cottage Living Magazine, remember that great magazine! Lunch Menu: Field Greens with Pears, Brussel Sprouts, Fennel, and Mint, RivaRose Brut, Cider Roasted Winter Squash, Herb Rotisserie Leg of Lamb with Mint Chimichurri, Domaine de Manion Syrah, and Caramel Apple Upside Down Olive Oil Cake. 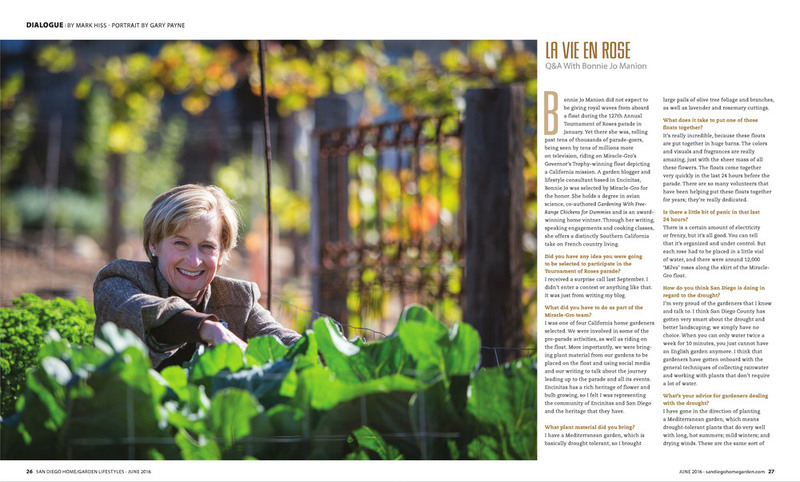 Writer Mark Hiss in his feature Q & A article, La Rose en Vie, asked me a few questions about my experience with being selected and honored by Miracle-Gro to ride on their beautiful float in the Tournament of Rose Parade, January 1, 2016. He asked me other pertinent questions about the state of gardening in San Diego under drought conditions, where gardeners can find good information and advice, and of course, why chickens. Read more online with the digital version, San Diego Home/Garden June 2016, scroll to Table of Contents, and click on your desired article and/or page number. Thank you San Diego Home/Garden magazine! Spend the day in Provence at Domaine de Manion. Experience a relaxing and enjoyable day of garden, vineyard, a multi-course cooking demonstration and lunch, take away recipes, and a chance to shop. Bonnie's love for Provence and healthy Mediterranean cuisine has lead her to travel to Provence often, take cooking classes, explore the markets, follow favorite chefs, and meet culinary icons. She invites you to enjoy "A Taste of French Country Living" through her "Lunch in Provence" culinary events, gardening, design, and lifestyle. Bonnie recreates her "St. Remy Cooking Class" menu from last year with Chef Yvan Cadiou. Choice of two dates, Thursday, June 23, 2016, or Saturday June 25, 2016. Please specify your preferred date when signing up. Your day begins at 10:30am at Bonnie's home, Domaine de Manion. Cost is $150.00 per person, a $25.00 discount when you sign up online with a friend or loved one. Limited to ten people per class, and 5 person minimum. Sometimes a single rose can say so much. My first time to the 9/11 Memorial and 9/11 Museum on a beautiful June morning. It is so very moving, and hardly comprehensible that this September 2016 marks the 15th year since this horrific day. You might have read about the "High Line" in garden design magazines, as it has become an urban landscape masterpiece. Once an elevated historic railroad line on the west side of Manhattan which was a life line for the industrial manufacturing sector transporting food and industrial products for New York City, today it has become so much more. Abandoned in 1980 and slated for demolition, two very savvy neighborhood residents got the idea of creating a 20 block walking park repurposing the elevated tracks. Enlisting Mayor Micheal Bloomberg and others, the project caught on and became reality in 2009. Today it is a stunning peaceful public green urban walkway, with views of the Hudson River on the west and vibrant city views to the east. My Husband, John, Observing the Contrast of Urban vs Landscape on North Side of "High Line"
Do You Know About Garden Collage? Garden Collage is a great new award-winning website for gardeners. I first learned about Garden Collage, when I was introduced to one of their gifted writers, Taylor Morgan, at the Carlsbad "Field to Vase" Dinner last April. I guarantee you will enjoy this garden website immensely. Experience last Aprils' event as if you were there, through Taylor Morgan's gorgeous photos and writing, Dinner Supports Local Food Flower Farmers. 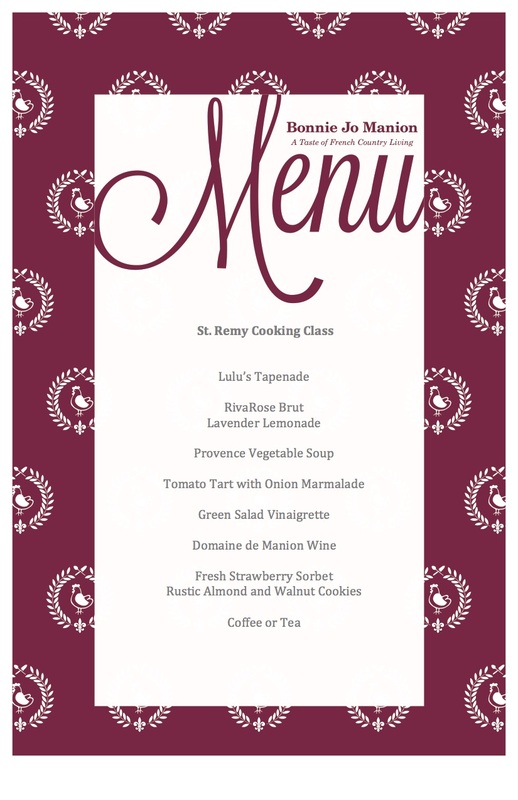 In June, Bonnie recreates her "St. Remy Cooking Class" menu from last year with Chef Yvan Cadiou. Choice of two dates, Thursday, June 23, 2016, or Saturday June 25, 2016. See menu below. Please specify your preferred date when signing up. Your day begins at 10:30am at Bonnie's home, Domaine de Manion. Cost is $150.00 per person, a $25.00 discount when you sign up online with a friend or loved one. Limited to ten people per class, and 5 person minimum. Thursday, May 12, 2016, 10:30am. Bonnie hosts and presents a "Luscious Lavender Lunch." A wonderful gift for a Mother's Day Celebration and/or an extra special treat with your friends. This seasonal springtime menu will have a hint of lavender in each course. Bonnie creates a seasonal menu--using many of the prevalent flavors found in Provencal cuisine, with many of the ingredients from her berry room, orchard, and potager. For more information and to sign up, please go to www.bonniejomanion.com or call (tel) (760) 402-7600.